Before the Second World War, the territory in which Ajax is situated was a rural part of the township of Pickering. The town itself was first established in 1941 when a Defence Industries Limited (D.I.L.) shell plant was constructed and a townsite grew around the plant. By 1945 the plant had filled 40 million shells; employed over 9,000 people at peak production; boasted of its own water and sewage treatment plants; a school population of over 600; 50 km (31 mi) of railroad and 50 km (31 mi) of roads. The entire D.I.L. plant site included some 12 km2 (5 sq mi). People came from all over Canada to work at D.I.L. The burgeoning community received its name in honour of the first significant British naval victory of the war. From December 13 to December 19, 1939, a flotilla of British warships — HMS Ajax, HMS Exeter and HMS Achilles — commanded by Commodore Henry Harwood — engaged and routed the powerful German pocket battleship Admiral Graf Spee at the Battle of the River Plate, near the Uruguayan port of Montevideo in South America. Ajax was chosen as the name of this war-born community. After the war, the University of Toronto leased much of the D.I.L. plant to house the flood of newly discharged soldiers who had enrolled as engineering students. War machines were moved out and the buildings were converted to classrooms and laboratories. By 1949, the last year of the University of Toronto, Ajax Division, some 7,000 engineering students had received their basic training there. Following the departure of the University of Toronto, the town's growth was largely due to the vision of George W. Finley of Canada Mortgage and Housing Corporation, and Ajax became a planned modern community using the wartime base for its post-war foundation. From 1941 to 1950, Ajax had no local municipal government of its own. In 1950, as a result of a petition, the community became the Corporation of the Improvement District of Ajax with three trustees appointed by the Lieutenant-Governor in Council. By 1953, the desire for full and active participation by its citizens in an elected council and school board was strong. The Ajax Citizens' Association, formed by many civic-minded persons, presented a brief to the Ontario Municipal Board urging that the Improvement District of Ajax become the Corporation of the Town of Ajax. The Municipal Board approved this step, and on December 13, 1954, the people elected the first Town Council and the first Public School Board. 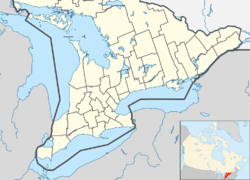 On June 22, 1973, the Ontario Legislature enacted Bill 162 to amalgamate the Town of Ajax and the Village of Pickering and annex certain portions of the Township of Pickering to the Town of Ajax, as part of the creation of the new Durham Region; this also included the remote lakeside Town of Pickering Beach. The Region and Town both officially came into being on January 1, 1974. Ajax is bordered to the West and North by the City of Pickering, to the East by the Town of Whitby and to the South by Lake Ontario. Today, Ajax is commonly considered part of the Greater Toronto Area, in the eastern part of the Golden Horseshoe region. The town's very auto dependent urban form, as well as that of its neighbour municipalities, has resulted in steady increases in traffic congestion with few realistic alternatives to automobile travel. There are long-term plans to widen regional roads and Highway 401, as well as extend Highway 407, but this essentially represents status quo development. Increases in Durham Region Transit service, ongoing efforts to improve cycling and walking conditions, and the above noted intensification initiatives may alleviate this to some degree. Ajax Council and a private developer entered into an agreement in 2012 for the purchase and sale of 9 acres (3.6 ha) of vacant town-owned land at the corner of Bayly Street and Harwood Avenue. Called "Pat Bayly Square", it will provide residential, retail and office space, as well as a civic square and civic facility. Pat Bayly Square opened in September 2018. Ajax is governed by an elected town Council consisting of a Mayor, and local Councillors representing each of the town's three wards. In addition, three Regional Councillors each represent a ward each. The Mayor and the Regional Councillors sit on both Ajax Town Council and Durham Region Council. In the past, Council has sat for a three-year term, but the Ontario Legislature increased the length of municipal council terms in Ontario to four years, in 2006. The last municipal election was held from 15 October 2018 - 22 October 2018. In 2018, Ajax Council shifted from two regional councillors and four local councillors to three regional councillors and four local councillors. According to the 2011 Canadian Census, the population of Ajax is 109,600, a 21.6% increased from 2006, which is approximately 4 times faster growth than Canada as a whole. Ajax's land mass is 67.07 km2 with a population density is 1,634.2 people per km2 and it has approximately 35,040 occupied private dwellings. The median age is 36.2 years old which is more than 4 years younger than the national average at 40.6 years old; 20.7% of the population is under 15 years of age while 8.7% are 65 and over. According to the 2011 National Household Survey, 95.3% of Ajax residents are Canadian citizens, and about 7.6% of residents are recent immigrants (from 2001 to 2011). The racial make up of Ajax is: White (52.5%), Black (16%), South Asian (13.8%), Southeast & East Asian (7.8%), West Asian & Arab (2.7%), Latin American (1%), and Aboriginal (1.7%). 2% of the population is multiracial, and the last 2.6% belong to another group. Ajax has the highest Black population percentage of any major Canadian city (population above 100,000). Religiously speaking, 18.6% of Ajax's population does not affiliate with any religion. For those who do identify as religious, the make up is Christian (81.9%), Muslim (8.5%), Hindu (7.3%) and the remaining 2.3% affiliate with another religion. According to the 2011 Census, English is the mother tongue of 76.1%, French is the mother tongue of 1.4%, and French/English bilingualism is mother tongue for 0.5% of the population; other reported mother tongues were Urdu (2.4%), followed by Tagalog (Pilipino, Filipino) (2.5%), Tamil (2%), Persian (Farsi) (1.4%), Arabic (1.3%), Spanish (1.1%), and Italian (1%), with 10.5% having one or more other mother tongues. As far as education goes, for those who are 25 to 64 years old, the highest levels of education are as followed: 67.1% of people have a post-secondary schooling degree, 26% have a high school diploma (or equivalent) and 6.9% have no certificate, diploma or degree; these represent somewhat higher education rates than either the Ontario or Canadian averages at 64.8%, 24.3%, & 11% and 64.1%, 23.2%, & 12.7% respectively. The unemployment rate, at 8.7% in Ajax, is higher than the Ontario rate of 8.3% and significantly higher than the national average of 7.8% unemployment, but that may reflect the much higher participation rate of 72.9% compared to 65.5% in Ontario and 66% nationally. The median household income before taxes is $88,262, and after taxes is $75,662, which is a quite a bit higher than the provincial or national figures at $66,358 and $61,072 pre-tax ($58,717 and $54,089 after tax) respectively. The median commute time to work for those 15 years and over was 35.1 minutes with 15.9% travelling by public transit including GO, 80.1% travelling by private car, truck, or van, and the remaining 4% travelling by other means (walking, bicycle, etc.). The median value of a dwelling in Ajax is $333,633 compared to the national number at $280,552, the Ontario figure of $300,862, and the Metropolitan Toronto median value of $421,834. The 2006 Canadian Census reported Ajax's population at 90,167 which was a significant 22.3% increase over 2001 numbers and almost 3½ times the 6.6% population increase average for Ontario during that same period. This brought Ajax's population density to 1,344 people per square kilometre residing in approximately 28,616 occupied private dwellings. The median age of 35.4 was significantly lower than Toronto's median age of 37.5, Ontario's median age of 39.0, or Canada's median age of 39.5 years old when the overall Ajax population included 22.6% under 15 years of age and 8% aged 65 years and over. 94% of Ajax's population were Canadian citizens with 11.4% being recent immigrants (from 1991 to 2006) including 3.5% having arrived within the preceding 5 years (since 2001). Of the Ajax population 15 years of age and over, which represent 77% of Ajax's total population, 38.8% immigrated to Canada, 23.3% were born in Canada to one or both parents having been born outside of Canada, and 37.9% were born inside Canada to both parents being Canadian born (and possibly their grandparents as well). Ajax's racial make up at that time consisted of: White (63.6%), Black (13%), South Asian (10.8%), Southeast & East Asian (5.7%), West Asian & Arab (2.1%), and Aboriginal (0.8%). 1.7% of the population was multiracial, and the last 2.4% belong to another group. The unemployment rate in Ajax was 6.4%, which was equal to the Ontario rate, but the employment rate of 69.7% was significantly higher than the Ontario average of 62.8%. The median personal income was $33,026 for persons 15 and over ($28,885 after tax) compared to the Ontario figures of $27,258 income ($24,604 after tax); median household income (2005) was $81,940 ($68,527 after taxes), which was significantly higher than either the Ontario median household income (2005) at $60,455 ($52,117 after taxes) or the Canadian average at $53,634 ($46,584). In 1945, with the closing of D.I.L., there was no industry within the town; but in 1949, Dowty Aerospace started operations in Ajax. By 1969, major employers included Volkswagen Canada, DuPont, Paintplas, Ajax Textile, AEG Bayly Engineering and many others. Shopping was virtually non-existent in the mid-1940s, but by 1970 major shopping centres such as Ajax Plaza, Harwood Place Mall and Clover Ridge Plaza were constructed. The 1980s saw an expansion of retail shopping malls to include Discovery Bay Plaza, Transit Square, Baywood Plaza, Westney Heights Plaza and most recently the Durham Centre at Harwood Avenue and Kingston Road. The 1970s saw the beginning of many physical changes to the face of Ajax. New subdivisions spread over vacant land in central Ajax. The early 1980s brought extensive development to the southern part of Ajax with large, upscale housing units constructed along Lake Driveway. The recession of the early 1980s did not stop residential development in Ajax. Westney Heights started north of Highway 2 and offered home buyers low interest rate mortgages while interest rates were then at an all-time high of 18% to 20%. Development north of Highway 2 stretched from Church Street in Pickering Village to Harwood Avenue, with the Millers Creek development south of the highway down to the edge of Highway 401. Ajax Downs is a casino that is located on 50 Alexander's Crossing, Ajax, ON, near the intersection of Kingston Road (Toronto) and Audley Road. It has been controversial since the announcement of the Durham Live casino in 2018. The Ontario premier Doug Ford had promised to keep the Ajax Downs open after the completion of the Durham Live casino. The Ajax and Pickering General Hospital first opened in 1954 with 38 adult and children's beds. It was expanded to 50 beds in 1958 and a major expansion to 127 beds took place in 1964. The emergency and outpatient services were expanded in 1975. The large growth of population in the Town has prompted a further expansion. Approval was granted in the fall of 1990 to further expand. In 1999, the Hospital merged with Centenary Health Centre in Scarborough to become part of the Rouge Valley Health System. Construction on a $60 million expansion began in 2007, although that has been marred by the highly controversial closure of the 3 West Mental Health ward in 2008, which was originally to be part of the expansion. The Durham Regional Police police Ajax from a station in Pickering. Durham Region provides Ambulance/emergency medical services. Ajax Fire & Emergency Services provides firefighting services from three fire stations. In 1973, the Town of Ajax conducted a survey of potential transit ridership in Ajax. This led to the creation of Ajax Transit with bus service beginning in 1973 under a contract with Charterways Transportation Limited, which operated service using a fleet of school buses, with heaviest ridership between the Pickering Beach area and downtown Ajax. Multi-use trail over Caruthers Creek. the overhead bridge carries a Canadian Pacific rail line (Belleville Subdivision). The closest international airport to Ajax is Toronto Pearson International Airport, located 50 kilometres to the west in Mississauga. Ajax is served by the Durham District School Board and the Durham Catholic District School Board. There are five high schools and several elementary schools. Two of the high schools are Catholic schools: Notre Dame Catholic Secondary School and Archbishop Denis O'Connor Catholic High School. The other three are the public secondary schools: Ajax High School, J. Clarke Richardson Collegiate and Pickering High School. The Ajax Rock are a box lacrosse team that, as of 2009, have been promoted to the Senior "A" Major Series Lacrosse league. They play during the summer months out of the Ajax Community Centre. The town is the home of two minor leagues, the Ajax Spartans Minor Baseball Association and the Ajax Knights Minor Hockey Association. There is also a growing rugby union club that has been established since 1949 called the Ajax Wanderers. Their clubhouse is located on 1717 Harwood Ave. N, just south of Taunton Rd. Ajax is home to several clubs: Ajax FC, Ajax United and Ajax Azzurri. The Ajax ringette association is popular. Ajax has a football team, the Ajax-Pickering Dolphins. Ajax Cricket Club is located in the community. Ajax is the home of the Ajax Skating Club and the Ajax Ice Waves, a synchronized skating team, and the Ajax Scuba Club. Kyle Johnson, professional basketball player and Olympian; grew up in Ajax. Snow, reggae artist, famous for his 1993 chart-topper "Informer"
^ a b "Ajax". Geographical Names Data Base. Natural Resources Canada. Retrieved 2014-05-19. ^ a b "Ajax, Town Ontario (Census Subdivision)". Census profile, Canada 2011 Census. Statistics Canada. 8 February 2012. Retrieved 2012-02-24. ^ "The Second World War created Ajax. Here's how". TVO. 2015-11-10. Retrieved 2018-12-04. ^ "Map Legend". Explore Ajax. Retrieved 22 January 2017. ^ "The New Downtown Ajax" (PDF). Town of Ajax. Retrieved 22 January 2017. ^ "Mayor and Members of Council". www.ajax.ca. Retrieved 2018-11-04. ^ "Municipal Elections Act, 1996, S.O. 1996, c. 32, Sched". Retrieved 2015-08-30. ^ "2018 Ajax Municipal Election voting period". www.ajax.ca. Retrieved 2018-11-04. ^ a b c d "National Household Survey (NHS) Profile, 2011". Statistics Canada. 2013-09-11. Retrieved 2014-01-28. ^ "Census Profile – 2011 Census". Statistics Canada. 2012-10-24. Retrieved 2014-09-23. ^ "2011 Census of Canada:Topic-based tabulations — Detailed Mother Tongue — Ajax". Statistics Canada. Retrieved 2014-09-23. ^ "1991 Census of Canada: Census Area Profiles". 2.statcan.gc.ca. Retrieved 2017-03-07. ^ a b c "Community Profiles from the 2006 Census". Statistics Canada. 2007-03-13. Retrieved 2014-09-23. ^ "Aboriginal Population Profile from the 2006 Census". Statistics Canada. Retrieved 2014-09-23. ^ "Ajax-Pickering Rock moving up to the Major". Archived from the original on 2013-12-20. Retrieved 2014-12-04. ^ "Women's Professional Soccer – FC Gold Pride – Candace Chapman". Archived from the original on 2010-08-10. Retrieved 2014-09-23. ^ McNair, Brian (July 31, 2012). "An Olympic Dream Come True for Ajax's Kyle Johnson". Yorkregion.com. Archived from the original on 2014-07-24. Retrieved 2014-09-23. Wikimedia Commons has media related to Ajax, Ontario. This page was last edited on 24 March 2019, at 21:02 (UTC).